Thanks to Alaska Airlines and Make-A-Wish Oregon, the teenager’s wish will come true when he flies to Hawaii later this month. But first, Alaska Airlines gave Payton another unexpected experience – a surprise visit with his favorite football player: former University of Oregon quarterback Marcus Mariota, the Heisman Trophy winner and the No. 2 pick in the NFL draft by the Tennessee Titans. Each year, Alaska Airlines “adopts” a child from Make-A-Wish Oregon as part of the airline’s involvement in the Portland Rose Festival. This year, it’s Payton, and Alaska employees in Hawaii and Oregon pulled a few strings to arrange his meet-up with Mariota, as well as other cool experiences over the past few months. “It’s crazy how much Alaska is doing for me, just because they want to help me out in the situation I’m in,” Payton said. Payton Williams and quarterback Marcus Mariota. On Saturday, June 6, Payton and his family (parents Spencer and Kim, and younger sister Shaylee) rode on Alaska’s float in the Grand Floral Parade in Portland. The float is a Hawaiian theme, in honor of Payton and his wish. Alaska Airlines First Officer JP Wilson, Payton Williams and Captain Don Kayler. Alaska employees gave Payton a behind-the-scenes tour of Portland International Airport, where he met Captain Don Kayler, the pilot who will fly the plane that takes him to Maui later this month. Today during Payton’s high school graduation ceremony, Captain Kayler and his wife will be there to cheer him on. Payton Williams and Captain Don Kayler prepare for the Starlight Parade in Portland. Captain Kayler plans to attend Payton’s graduation today, and in a few weeks, he will fly Payton and his family to Hawaii. 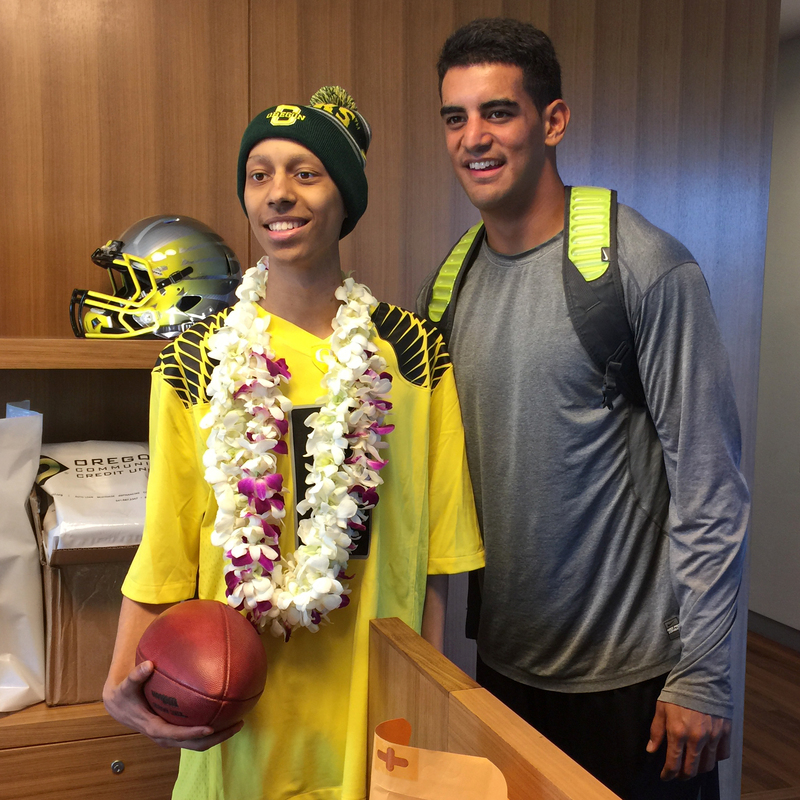 Back in April, the entire plan to meet Mariota was kept secret from Payton, who had just finished his final chemotherapy treatment the day before. He wasn’t sure what was happening when a limousine picked up the family at their home in the Salem-Keizer area. During lunch in Eugene, Diaz-Nicolaidis and Chris Bowe, Alaska’s system cargo manager in Portland, dropped hints and eventually unveiled an Oregon football jersey with the No. 8 on it. Payton wore the yellow No. 8 jersey, an Oregon cap, and the family was decked out in Hawaiian leis – Mariota grew up in Hawaii. At the university, they were introduced to Mariota, who signed autographs and gave them a tour of the football facility. 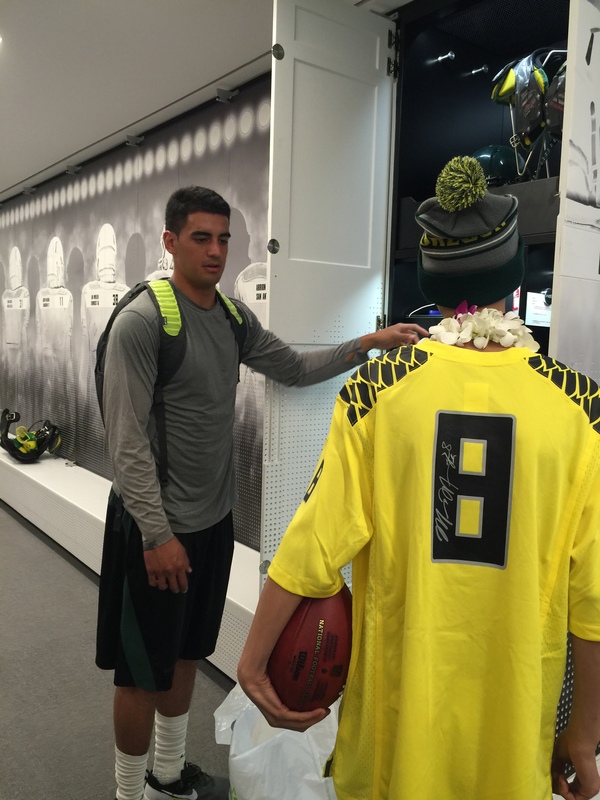 At the University of Oregon, Marcus Mariota shows Payton Williams his locker. Later on, Mariota passed a football to Payton. Payton’s mom, Kim, said Mariota was extremely friendly and down to earth, and spent time talking with the family between his workouts for a couple of NFL teams who were scouting him. Mariota was drafted by the Tennessee Titans with the No. 2 pick overall. 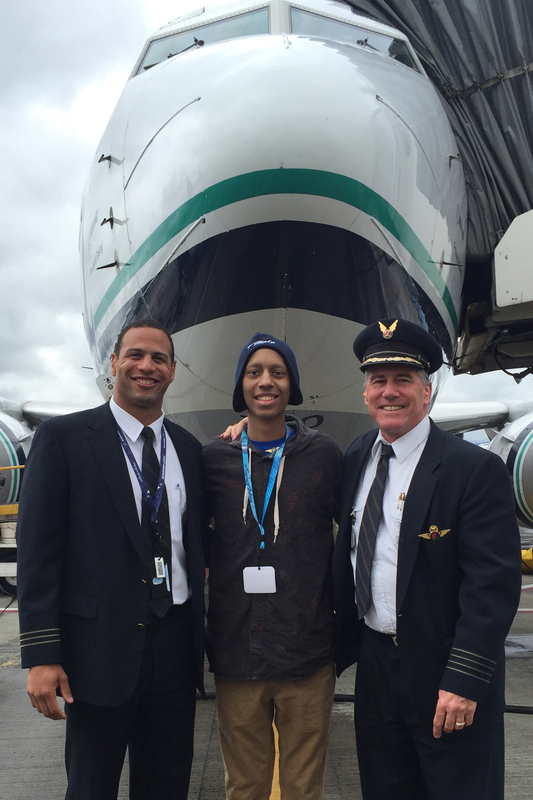 After graduation, Payton and his family will fly to Maui on Alaska Airlines, with Captain Kayler flying the plane. Payton also might want to start planning his own trip to Tennessee this fall – Mariota and Payton have stayed in contact and exchange text messages. In the fall, Payton plans to attend Oregon State University, the rival school of Oregon – Mariota couldn’t quite recruit him to Eugene. Make-A-Wish grants the wishes of children with life-threatening medical conditions to enrich the human experience with hope, strength and joy. Alaska Airlines has supported Make-A-Wish for nearly 30 years and provides air transportation to help wishes be granted. In 2014, Alaska Airlines Mileage Plan members donated 53.7 million miles (about 1,300 round-trip tickets) to 11 different charities, including Make-A-Wish. To donate Mileage Plan miles, visit alaskaair.com. 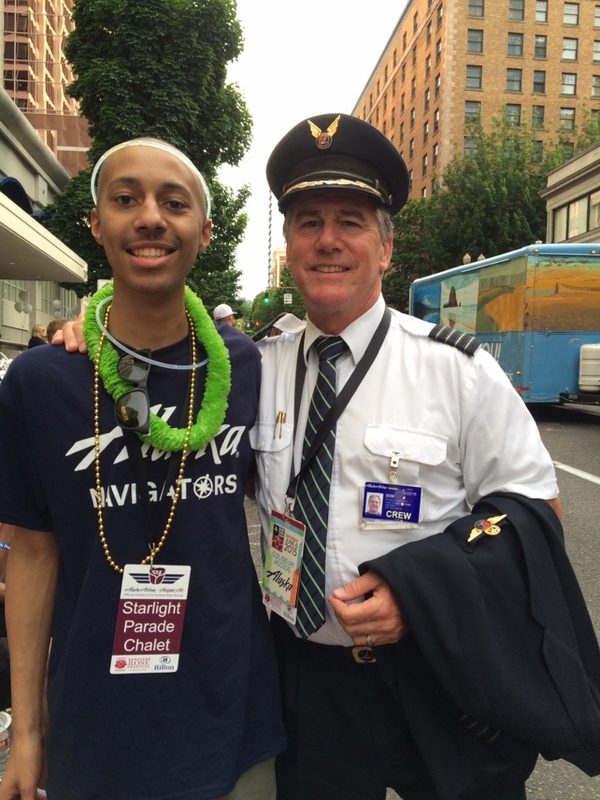 5 comments on "Under our wing: PDX Rose Festival team honors Make-A-Wish teen with parade float, flight to Hawaii, meetup with Mariota"
This us great. Thanks Alaska! Thank you Contesa Diaz-Nicolaidis for making this happen when everyone told you it couldn’t be done! What a wonderful day for a deserving young man. I’m so proud to work for a company whose employees have such big hearts. The joy we bring this young man will be with him a lifetime. Great article Cole! What a wonderful thing to do for such a deserving family.